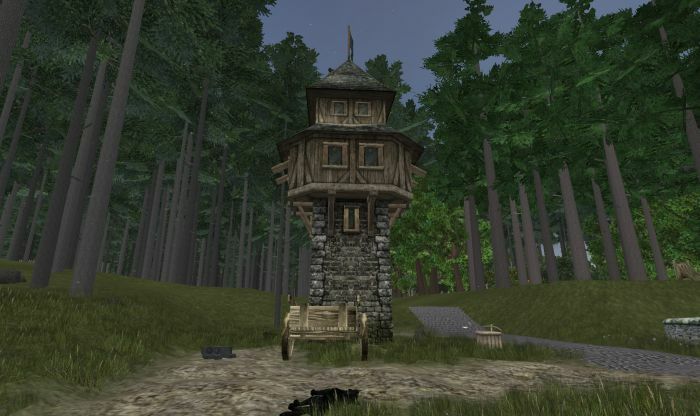 Guard Tower Completed – Next Project? #Wurmonline – Nomadic Gamers, eh! It took the better part of two days of continuous work between Yetian and I, but we finally managed to finish off the guard tower that sits just on the perimeter of his deed. Guard towers are wonderful. First of all, they have no monthly upkeep cost, so there is an appealing factor right off the bat. Anyone can make use of them, and they won’t attack random mobs that wander into your deed unlike the spirit guards (although you can set spirit guards to passive). If you require help from a guard what you need to do is be sure you have the mob targeted that you’re trying to have killed, be in combat with them, be in range of a guard tower, and say ‘guards’ or ‘help’ in local chat. The quality of the guard tower dictates how many guards you have, there are four at the tower above thanks to the improving that Yetian did to the structure. It should be more than enough for the creatures that we get wandering our way. I spent some time wandering yesterday (one of my favorite hobbies in Wurm) and found some guards dead, alongside a troll corpse. No one had butchered it yet and it wasn’t on deed, so I took a few parts from the troll and buried it. I also buried the corpses of the guards, which gave me a nice chunk of alignment change. With some heavy consideration I’ve decided to go back to a priest of Fo, I had dropped back down to follower because I wanted to destroy a wall (and my alt doesn’t have the strength at the moment). I tried playing a few other games, but my interest just wasn’t held, it seems like Wurm has spoiled me and themepark MMO’s just don’t hold my attention (although I do have a huge impulse to play EVE, that’s another sandbox). I’ve decided to continue with two Wurm accounts and I’ll keep one as a priest and one as a follower. As you may recall from a previous post, priests are unable to do a lot of things with the added benefit that they can cast spells. Hopefully I manage to stick it out with being a priest for longer than I did last time. I’ve done a LOT of work on my deed, and even sold my second deed (well, OK I gave it away) – but those are posts for another time (like later on today). As always happy gaming no matter where you find yourself!